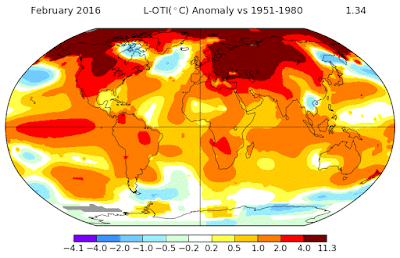 Yes, it's another hottest on record, this time in March 2016. According to GISS NASA, the average for March was 1.28 °C, which is 0.36 °C above the previous hottest March, in 2010. It's the second highest anomaly for any month, the highest being last month, February, which was 1.34 °C. The average for the three months to the end of March is 1.25 °C, which is 0.39 °C higher than any previous Jan-March period. 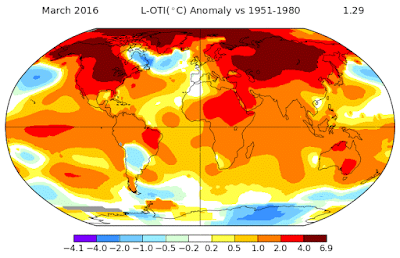 The previous highest was last year with an anomaly of 0.86 °C. This is the sixth month in a row of "hottest months", all of which had an anomaly more than one degree Celsius above the 1951-1980 mean. Update: I did a quick check and that hasn't happened before in the record since at least the 1950s. Earlier times probably aren't sufficiently accurate on a month by month basis to say and, in any case, pre-1950s temperatures would probably have been hotter at some time in the last couple of millenia. 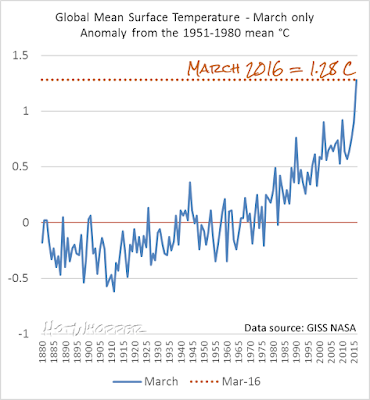 Figure 1 | Global mean temperature anomaly - month of March only. Data source: GISS NASA. The high latitudes in the northern hemisphere had the highest anomalies this month, as they did in February. This month the heat spread out and down a bit in parts, particularly down in Africa from the look of it. The record hot March in south eastern Australia can be seen too. This differs slightly from the JMA numbers, which is to be expected since they used slightly differing processes. So the pause is back? Haha. No global warming for... (1) month/s. The new ice age cometh. It's a new pause, not the old one returning. The un-pause lasted only a coupla months. AGW is dead. Final nail. Fatal stake. Yes, the way Monckton had calculated his previous pause was to find the longest stretch that ended at the current date which had a negative slope. Last month was hotter than this month in the GISS record, so the temperature trendline from February of 2016 to March of 2016 is down. That means he have, so far, a one-month pause. 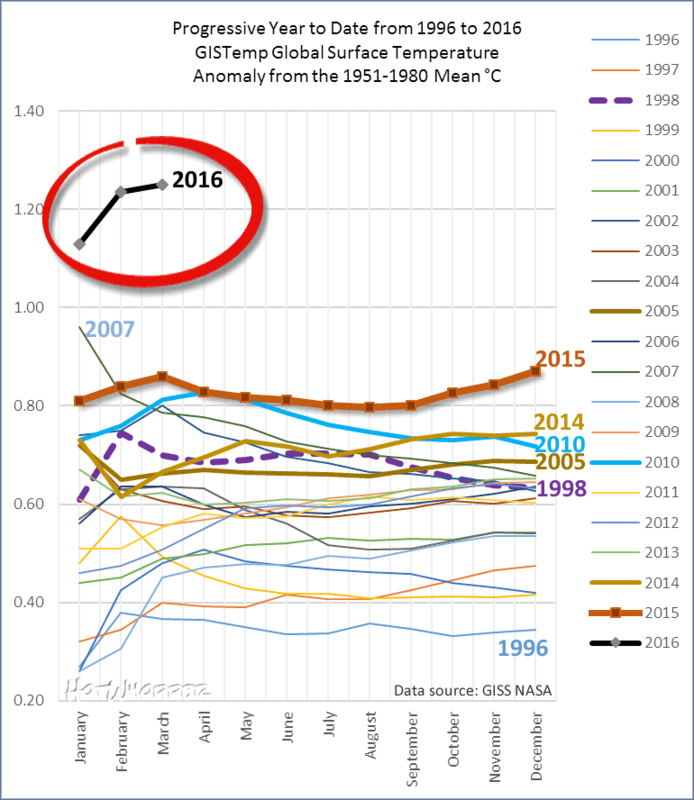 NO GLOBAL WARMING SINCE FEBRUARY OF 2016! At -0.09C/month, we're just a few years from a devastating ice age. DRILL BABY DRILL. Well, in the Generalissimo Franco sense, it can't die. That's why Saturday Night Live had to keep reassuring people that Franco was still dead. There will be an infinite amount of "pauses." With a term that is so undefined (ill-defined? ), it can't be refuted. It's like when "skeptics" self-reference as skeptics. Perhaps Bill Nye should challenge Palin to a live debate on the science of climate change. That should provide enough material to last Tina Fey for years. To nick a quote from Denis Healey: Being 'attacked' by Sarah Palin is "like being savaged by a dead sheep". Nye took an astronomy course taught by Carl Sagan. I think that counts as more a scientist than Sarah Palin. Sarah Palin is as good a scientist as Bill Nye? Wow. That makes the Science Guy a pretty poor Science Guy. Maybe what Palin meant to say was "Scientologist," and she got that wrong, too. If you want to see the total incoherence of Sarah Palin have a look at what happens when here teleprompter fails. I suppose that means she learnt to read somewhere along the line. It's just her thinking that's off. The only defect with Bill Nye is that his bow-tie doesn't spin. And googling about her own education and relevant merits shows her claim even more (if possible) bizarre. In other words it is an epic claim which is currently being repeated in many denialist (and unfortunately other) places. Generating publicity for Morano's movie.. Omg.. The deniers are probably doubly annoyed by Nye: being an engineer usually means climate science denier too so he's the exception and more power to him. I believe Palin studied communication and journalism. That's ironic. Palin has turned profound ignorance into an honorable badge. She thinks that to be a scientist you must wear a white lab coat and speak in a central European accent while cultivating an Einstein style haircut. No Millicent, the scientists on your side need only be bald-headed, bearded boffins. Good heavens now Mack thinks he is Sarah Palin. The poor man is having an identity crisis. I did a quick check and that hasn't happened before in the record since at least the 1950s. Earlier times probably aren't sufficiently accurate on a month by month basis to say and, in any case, pre-1950s temperatures would probably have been hotter at some time in the last couple of millenia. Wow, six hottest months in a row hasn't happened for as far back as can be accurately measured. That's another new record then. Note that JMA says there have been eleven hottest months in a row. I expect the denialsphere to insist this is because of the not-very-strong el Nino. Once la Nina sets in late this year, all will be back to normal. Whatever that is. Anyway, it's all just weather, right? Oh and also, this is just surface temperatures which are all faked. The only accurate and meaningful measurements are from satellites which directly measure the air, up where airplanes live, by dangling thermometers on ropes from orbit. See, according to UAH, March was only the third warmest month ever, so that's not bad at all. Yeah - you caught on DC. My bad for leaving out the essentials. Six months in a row of the hottest ever for that month. I think that would probably be a record going back a few millennia at least, if you start at the beginning of the Holocene. The previous high point was about 8,000 years ago IIRC. Looking at Fig. 5, and keeping in mind it's early yet -- assuming El Nino tails out similar to 1998, 2016 would handily beat 2015 for warmest year on record according to GISS. Call it about, oh 1.1 C over the baseline. I could hedge and shave a tenth-degree off. Whatever the case, I think it's safe to say that the next Pause won't be starting up until at least 2017. How very ironic that this makes me somewhat happy. To be colder than 2015, the average for the remaining 9 months could be no less than 0.74C. Two years ago that would have seemed like an easy target. I think you mrant "...the average for the remaining 9 months could be no more than 0.74C." I'm a bit under the weather myself. Speaking of, I forgot that you did a progressive YTD for Fig. 5. 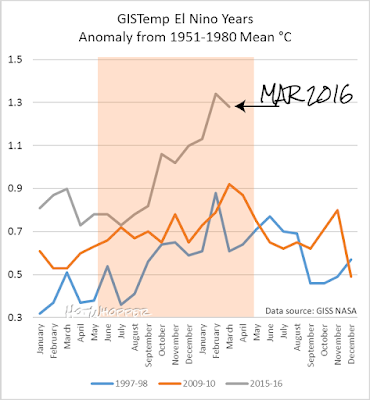 I projected out GISTemp for 2016 using the 1998 monthly anomalies as a template and get an annual mean of 1.18 C above the 1951-1980 baseline. Same trick for HadCRUT4 (using first two months coz March isn't in yet) and come up with 0.95 above the same baseline. 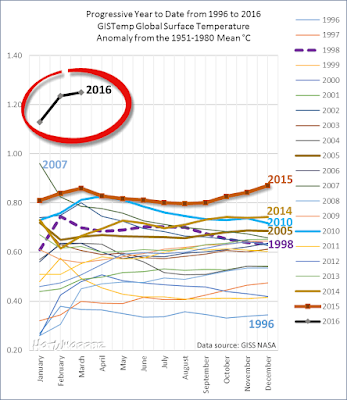 That beats 2015 by 0.32 and 0.15 C respectively. Not cool. Will be interesting to see what happens with UAH/RSS. Brandon it's not you, it's me not explaining the chart properly (which I usually do). Figure 2 above is some indication of what can be expected when El Nino dissipates. I wouldn't count on a huge fall, given the anomalies in the higher latitudes in the Northern Hemisphere. Some of that would be from heat going north from the equatorial Pacific, but by no means all of it. We're in uncharted territory now. According to Gavin Schmidt, 2016 will easily beat 2015. Based on the correlation between the first three months of previous years and their final annual average, I would project 2016 to be around 1.1 C as well. But I'd be highly cautious about putting any reliance on that figure, simply because the start of 2016 is so exceptional. Given that there us no reason to assume that "pause" will be defined with the smallest increment of measure being one year, starting at the beginning of a year, and being of any particular predetermined length, I think you are most certainly wrong about that. A "pause" can occur one week in mid-July. The fact that a "skeptic" can simultaneously argue that only one metric (SATs) equates to "global warming" and that there has been a "pause" even as they argue any measure of surface temperature is fraudulent, and that it is impossible to meaningfully measure "global temps" anyway, proves that logical coherence is not required to observe a "pause"
Bellman, agree this should all be taken with a grain of salt. I think it implausible that temps will fall such that 2016 <= 2015, but who knows -- we could get a volcano. It's fun to wager, and seriously that is all that I am doing. Joshua, not being able to hold two conflicting beliefs at the same time (I hope), my snark tends to prevail on logical consistency. Your point is, however, quite well taken. I have noted that a short upward spike does not end "The Pause", but any downturn is the harbinger of the next Ice Age -- much in the same way that a slight single-season upturn in Arctic sea ice extent is a "recovery". Of course, everyone knows that the planet really isn't warming at all over the long term, just look at bulk upper air temps as measured from orbit in conjunction with growing Antarctic sea ice extent. It would be interesting to see Gavin's methodology. Does anyone know if he's published this? It's not at RC yet. Haven't seen one (haven't looked), but in his reply to Victor V., he wrote: "uncertainty is based on the spread in the residuals over all previous years." So I'm guessing what he did was compute the 95% CI of all annual means relative to the first three months of each individual year. If I weren't about to go to bed, I'd try it. "So I'm guessing what he did was compute the 95% CI of all annual means relative to the first three months of each individual year." I make the forecast for the year 1.09 C, with a 95% CI of 0.93 - 1.25. I'm not sure how much difference being an El Niño year would make to this forecast though. 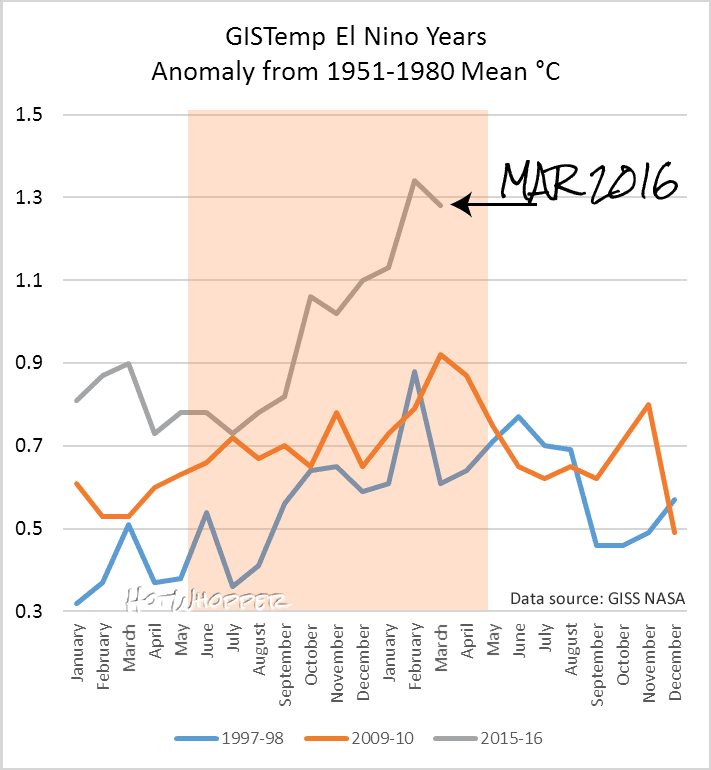 Using the same technique with NOAA's figures for March 2016, I estimate there's a 95.8% chance of 2016 beating 2015. Hot today, hot tomorrow, but never hot yesterday. Mad hatters tea party at the Whoppery. Mack I'll bow to your experience in the matter of madness. Shorter Mack: paleoclimatologists can't walk and chew gum at the same time. How does it feel, Mack, to have been such an obnoxious prat for years in the service of a cause that was wrong, wrong, wrong? What are all you ludicrous people going to do to atone? The least, of course, is to STFU. But you won't, because that would mean acknowledging that the world would really have been better served had you never been in it. More of your trademark fallacious logic, eh KarenMackSunspot? Yes, it was hot in previous years. Just not as many extreme/record events of warmth compared to today. And the future will see even more extreme/record events of warmth compared to today, to the point that biodiversity and ecosystem functions are compromised. That's the bottom line. And nothing in science contradicts it, and in fact there is a huge body of work that supports it. Which is why you persist in resorting to logical fallacy in order to deny that's staring right at you. I was going to write some unkind remarks, but Mack's own post is a most devastating critique of his failed position. Look in the mirror Mack: I know you don't want to but its really long past time that you forced yourself to do it. In fact I know (because it has happened on another forum I contribute too ) that what they actually do is accuse you of being "sneering"
Ah, she used to hang out at Deltoid, right? "Ah, she used to hang out at Deltoid, right?" Deltoid? Correct. It was actually poor sockpuppet persona management while getting over-excited in deriding me that finally confirmed 'she' was Mack. My referring to obnoxiousness above is not flippant; the trolls that have roiled in the mud in the name of their toxic - and clearly wrong - cause fully deserve to be shamed. Ah, I see that Bill beat me to it. It was an interesting time at Deltoid, and revealing in showing how impervious to shame are the trolls of this ilk. KMS didn't blink in the face of being caught out in his blatant attempts at puppetry - let alone at the demosntrations of his woeful logical fallaciousness, his steadfast ideology, and his general gobsmacking ignorance/ignorings of science. Given the bizarre almost-summer days and nights that we've had in the first half of April, and if that trend is reflected globally, I'd not be surprised to see the April anomaly jostling the March one for attention. How could CO2 possibly lead to early springs and record daytime temperatures? That is due to incoming radiation, not trapping outgoing LWIR. CO2 also can't cause El Ninos, nor does LWIR between 13 and 18 microns warm water. There are simply a lot of observations that simply can't be explained by CO2. I don't understand the question. Perhaps you don't know that the world is warming, hence spring arrives earlier and you can get more record high temperatures. You might not have heard of the greenhouse effect. It's worth looking up if you are interested in why the world is warming up, and the connection with CO2. Some plants are temperature sensitive and bloom earlier when spring temperatures warm earlier in the year. The rest of what you wrote sounds like something you got from some pseudo-science blog. It makes no sense at all. I don't know about the question but I do wonder what sort of idiot would claim CO2 is life. The Lake Nyos disaster occurred on 21 August 1986, when a limnic eruption at Lake Nyos, in northwestern Cameroon, produced a large cloud of carbon dioxide (CO2), which descended onto nearby villages, killing 1,746 people and 3,500 livestock. 1. The greenhouse effect warms by retarding cooling as much as anything. If a winter does not get as cold as it usually does, spring will come "early" as less sun is required to warm the countryside up again again. Think how cloudy nights are usually warmer than clear nights, especially in winter. 2. No climate scientist (to my knowledge) is claiming CO2 causes El Ninos. So this is a straw-man. But if you have credible evidence, go ahead and post. 3. LWIR does indeed warm water. You are trying to argue that water "skin" red-herring I have seen before. The top of the water is turbulent so there is mixing at the skin layer. LWIR slow water COOLING at night. LWIR can also warm water by indirect means. 4. There are indeed a lot of observations that can't be explained by CO2. Universal gravitation for one. Or nuclear fusion. Or the expanding universe.